Our adults ballet classes are designed for dance lovers and ballet enthusiasts with no prior training or background in dancing. Classes are simple and fun to learn, no age limit. Benefits of learning ballet include: improving posture, muscle tone, hand-eye coordination, flexibility, fitness, grace, and self-confidence. Students will be introduced to basic ballet techniques, barre exercises and ballet terminology, with detailed explanation on how to initiate and execute proper movements. Classes are on-going and can be joined at any time. Q:AM I TOO OLD TO START LEARNING BALLET? Definitely not! Our classes cater to adults of all ages. It is very safe, and ballet will help you develop proper posture, eliminate hunchbacks, improve your flexibility and strengthen your muscles. It also helps to improve blood circulation to your heart and lungs. Q: CAN FAT PEOPLE LEARN BALLET? Of course! Fat people looking to slim down should definitely take up ballet. Ballet exercises have been shown to tone and build muscle - making the body slender and strong over time. Q:WHAT ATTIRE SHOULD I COME IN? Classical children's ballet classes for aspiring dancers from age 3 and above. We make dance fun to learn! Our children's ballet classes will guide and help develop your child's physical and artistic potential. Your child will learn and develop a keen sense of music rhythm, poise, grace, balance and self confidence. All classes are conducted in a lively, fun-filled environment, and your child will learn comfortably and easily. Our dance exercises are built around themes to motivate the child’s imagination, creativity and encourage participation. Your child will learn the best in ballet dance foundation work. 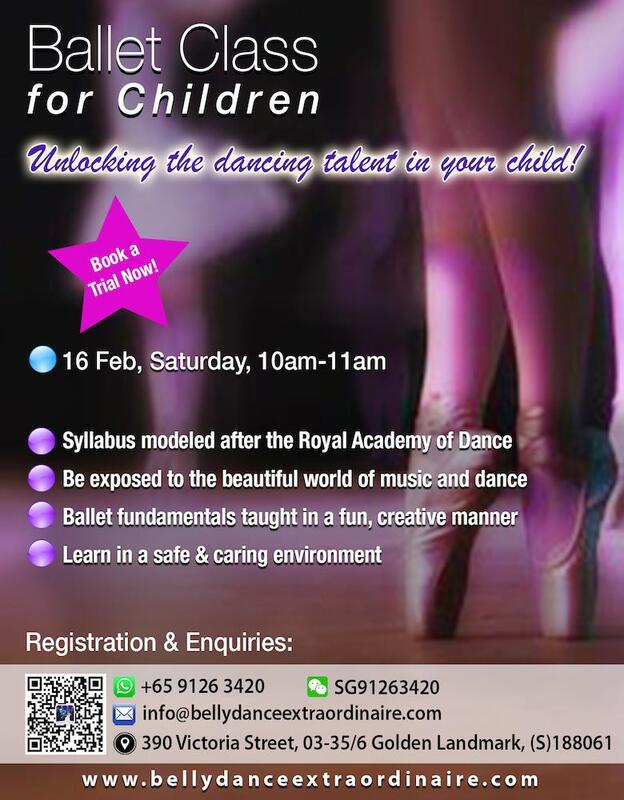 Join us for a trial class at $15 per child (age 3 and above), on 16 Feb, Saturday, 10am-11am. Absolute Beginner Adult Ballet Classes. Develop poise, grace and elegance with us today! Our adults ballet classes are designed for adults with no prior dance training or background. Classes are simple and fun to learn and we welcome all age groups. 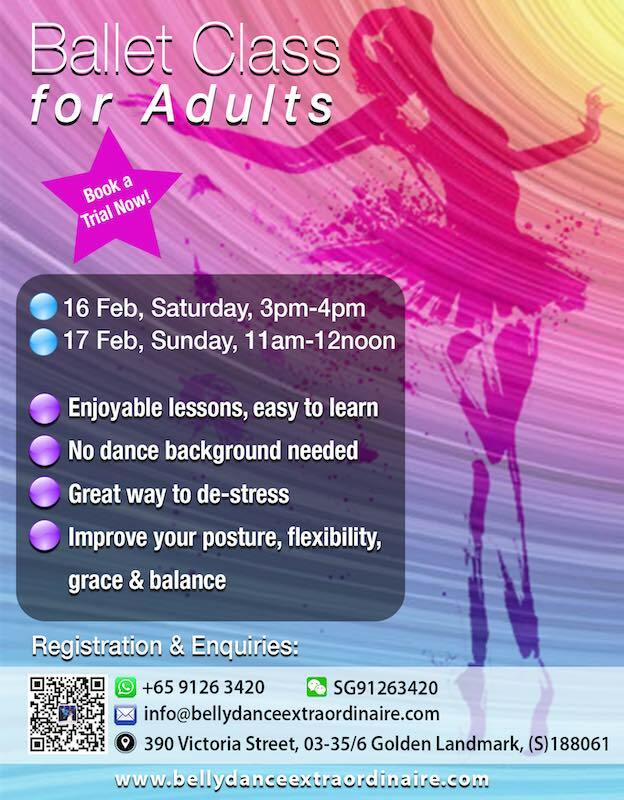 Join us for a trial class at $15 per person, on 16 Feb, Saturday, 3pm-4pm or 17 Feb, Sunday, 11am-12noon! Ballet instructor Tacy is a graduate from the Royal Academy of Dance (RAD) and a registered teacher with the Beijing Ballet Dance Academy. She majored in dancing at the Nanyang Academy of Arts in Singapore. 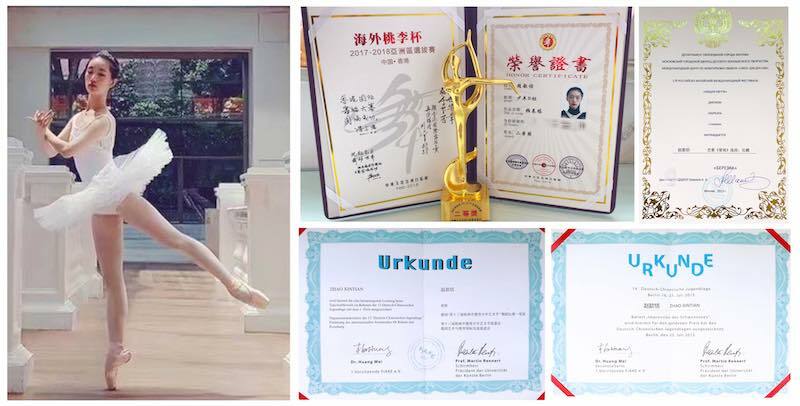 2018 - Awarded second prize in ballet in the overseas Tao Li Cup Asian Finals. 2017 - Awarded second prize for ballet in the Shanghai Tao Li Cup Shanghai Competition. 2016 - Awarded Ballet Bronze Award at the International Chinese Dance Dance Shanghai Finals. 2013 - Awarded the first prize in ballet in the Sino-Russian Art Festival Dance Competition. 2012 - Awarded the Certificate of Excellence in Chinese Dance. Tacy has been practising ballet since childhood. She has competed and won outstanding awards in numerous competitions both locally and overseas. Tacy has performed and choreographed for numerous festivals and events. As an instructor, Tacy has a rich experience in teaching children and adult classes in Beijing and Singapore. She is patient and detailed in her explanations.